At around 11 PM on the night of 1st October 2015, a landslide took place in the Santa Catarina municipal district of the greater metropolitan district of Guatemala City. The landslide affected an urban settlement called El Cambray 2. The National Coordinating Agency for Disaster Reduction of Guatemala (CONRED) activated its National Emergency Operations Center early in the morning on 02 October. As of 10:00 AM on 6th October, the number of fatalities had risen to 161. CONRED estimates that there are still between 400 and 500 persons missing, as the landslide affected nearly 125 houses. Search and rescue efforts continue with the aid of specialized rescue teams from Mexico and heavy machinery. Local experts are conducting assessments to determine the susceptibility to landslides of neighbouring areas and to identify ways to stabilize the ground. A local command post was established by municipal authorities and CONRED to coordinate inter-institutional efforts on 02 October and temporary shelters have been set up to accommodate those affected. On 13 October the National Coordinator for Reduction of Disasters in Guatemala suspended the rescue mission, counting 280 people dead and another 70 missing, 386 people survived the landslide of the 1st October. Guatemalan officials further confirmed the establishment of a criminal investigation to clarify the circumstances causing the landslide. Meanwhile, Valerie Julliand, resident coordinator for the UN System in Guatemala said that rain triggered the landslide, but Guatemalan authorities missed to take preventative actions: “What happened in Santa Catarina Pinula goes beyond a natural disaster”. Instead, Julliand assumed institutional weaknesses related to corruption responsible for the landslide. 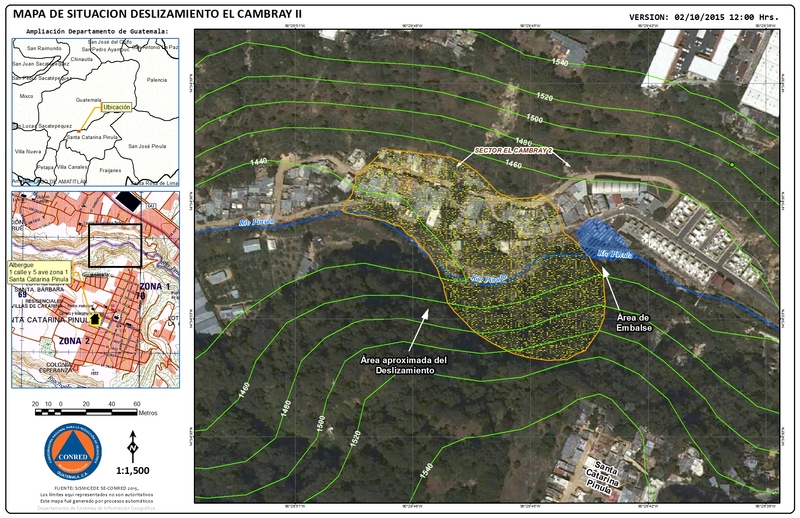 Since 2008 the urban settlement of El Cambray 2 was identified as a high-risk area by CONRED. UN-SPIDER and the National Space Activities Commission of Argentina (CONAE) supported CONRED in the request for activation of the International Charter Space and Major Disasters. The International Charter was activated for this landslide on 7 October by the United States Geological Survey (USGS). Digital Globe has contributed through the provision of archived and up-to-date satellite imagery to contribute to response efforts. Pre- and post-disaster WORLDVIEW2 data and post-disaster SPOT6 data can be browsed via USGS's Hazard Data Distribution System (HDDS). A Landsat8 scene of 4 August 2015 can be directly downloaded from HDDS, commercial high-resolution data can be downloaded with a special user account that can be requested directly via HDDS.